OPEN HOUSE SATURDAY, FEBRUARY 14TH!! Come visit the Pet Rescue from 10 a.m. to 3 p.m. to visit, pet, and check out all the four legged friends needing a loving home. Maybe you’ll find your sweetheart! We are now open!! 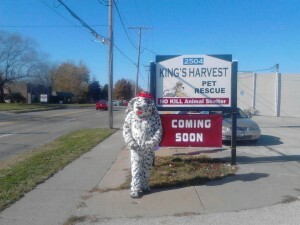 The doors to the King’s Harvest Pet Rescue has opened at 2504 W Central Park, Davenport, Iowa. The Pet Rescue is the only No-Kill Shelter in Davenport. The rescue was first opened to help the homeless have a place for their pets until they were able to get back on their feet. We are looking for morning and evening volunteers. Fill out an application on line or give us a call. We are also needing canned cat and dog food, dry cat and dog food, tidy cat clumping litter, paper towels and cleaning products. Our phone number is: 563 386-3117. Open hours are 10:00 a.m. to 5:00 p.m. on Monday, Tuesday, Wednesday, Friday, and Saturday. The Pet Rescue is closed on Thursdays and Sundays.